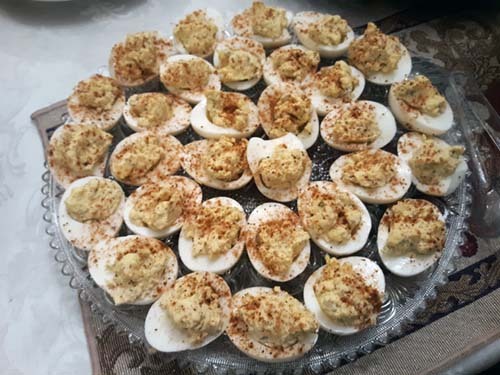 There are as many different deviled egg recipes as there are stars in the sky. Our version uses both horseradish and Old Bay to amp up the flavours. A winner in our neighbourhood Deviled Egg-off…great at any gathering any time of the year! Cut eggs in half lengthwise. Remove yolks and place in a bowl; set whites aside. Either mash the yolks manually or using a hand mixer on low. Add mayonnaise, horseradish, dill, dill pickle cubes, mustard, and pepper; mix until well combined. Mixture should be thick. Using two spoons, return yolk mixture to reserved egg white halves. Dust eggs with Old Bay Seasoning. Keep chilled until time to serve. Makes 36 appetizers, which serves about 9.